We hope you find the information here on the planet section helpful. It's always interesting to read some of the facts about other planets simply because some of them are really cool. I know, maybe you don’t think so but I guarantee you'll learn something in this section. The daytime temperature on Mercury can reach up to 400⁰C. The atmosphere of Venus is made up mostly of carbon dioxide. Out of all the planets Mars has fairly calm conditions, without raging storms and all sorts! Although it does have some fairly hectic dust storms, which change its surface all the time. These dust storms can last for months and sometimes cover the entire planet. 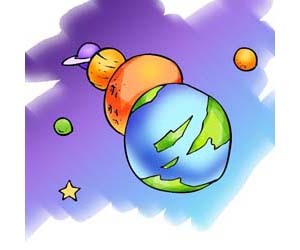 Let's dig in and enjoy learning about the planets in our solar system. Sit back and get ready for a trip to Mercury! Okay we can’t really take you there, but here’s everything you need to know about this amazing planet. Venus is a rather fascinating planet. It’s very similar in size to Earth, but very different in lots of other ways. Earth is so unique and different that it is nothing like any of the other planets in our solar system. But why? Did you know that Mars is actually sometimes called the ‘Red Planet’? Well the reason for this is that is has covered in rock and red dust made from iron, which makes it look red! Cool. Did you know that Jupiter is the largest planet in our solar system? Well it is, and it’s also quite famous too, well not famous like an actor! Of course Earth is beautiful, but Saturn should certainly stand up and take a bow for its beauty too, with those awesome rings that we can see. Uranus likes to be a little bit different and show off its awesome blue-green haze. This is something pretty cool to see. Neptune is one seriously large planet that has some really extreme weather conditions. It is further away from the Sun than any other planet in our Solar System.